Wood & Hughes in 1845. 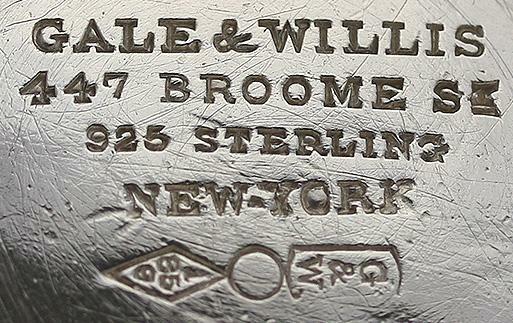 Makers of sterling flatware and holloware. partnerships, the firm evolved into Dominick & Haff. M.W. Galt, Bro. & Co. Successor to M.W. Galt & Bro. Became Galt & Bro. in 1892. Makers of the George Washington spoon, the first souvenir spoon made in the United States. Was in the partnership of Griffith & Gaither with Greenberry Griffith 1809-1812. Founded by Michael Izrael. Website. Dominick & Corning (a wholesale business) 1867-1868. Gale, North & Dominick 1868-1869. Gale & Corning (wholesale) 1869-1870. 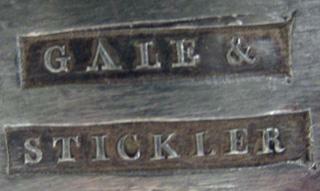 Gale, Dominick & Haff 1870-1872.